No NCAA basketball title releases this year, but that doesn't mean people can't sue over ones made last year. A former Tennessee player is joining the legal action against the NCAA and EA Sports over their use of his likeness. 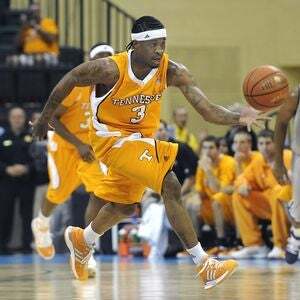 The suit filed by Bobby Maze, a standout basketballer for Tennessee who nonetheless was not drafted by the NBA this year, will join one brought last year by former Nebraska quarterback Sam Keller, and other former athletes seeking class action status against the NCAA. Maze's complaint also names the Southeastern Conference and EA Sports as those who profited by exploiting his likeness. Collegiate sports games do not name players, but the current performers are identifiable by nearly every other trait in the game's roster - height, weight, ethnicity, uniform numeral, position, and year in school. Attributes and ratings also closely match their real-world prowess. Freelance industries of roster modifiers have supported these titles for nearly a decade, and the games now include the means of conveniently sharing roster files online, even among gamers not in your friends list. Maze's suit also claims that the NCAA's standard practice is to only offer athletes one year scholarships, leaving athletes vulnerable to being cut at any time, and unable to negotiate more favorable terms with schools willing to guarantee multi-year scholarships. The complaint was filed in federal court in California.